Throughout much of the ensuing five decades, Dwan languished in assembly line B productions that provided him few, if any, opportunities to show off his skills. Even when he did receive an A budget, as in Twentieth Century Fox's Suez (1938), a fun adventure drama loosely based on the building of the Suez Canal, the studio immediately pushed Dwan back into B productions. After Dwan moved to Republic and directed The Sands of Iwo Jima (1945), the story was the same: once the production was finished, the studio sent Dwan back to anonymous programmers. It was almost as if the studios were attempting to sabotage his career. Because VCI Entertainment has recently released these films on DVD, we have the opportunity to re-examine these films. The results are somewhat surprising. While none of these four films can truly be called great, they're good, efficient Westerns that adopt a charmingly naïve viewpoint. While many '50s Westerns were redefining the genre in decidedly pessimistic tones (from the revenge bent heroes of Anthony Mann's Westerns to Henry King's downbeat The Gunfighter), the Dwan/Bogeaus Westerns give us characters who are about as complicated as those in B Westerns. That's not necessarily bad. There's something refreshingly simply and attractive in these characters. As in a Hopalong Cassidy or a Roy Rogers series Western, you know what to expect of any character in the Dwan/Bogeaus Westerns after only watching them for a few seconds. In spite of (and maybe because of) the frequently headstrong rush supplied by the plots, few psychological complications emerge. In Cattle Queen of Montana, for example, the death of Barbara Stanwyck's father provides the galvanizing factor in her life: she will see through his plans at all costs (including her own life) for developing a Montana cattle ranch. And in Passion, the murder of Cornel Wilde's wife-to-be provides the impetus for a revenge streak: he will not stop until all the responsible parties are dead. In both cases, the films take little time to question the mono-manias of their lead characters. In Cattle Queen of Montana, the film wholly supports Stanwyck's quest. She's good and the land grabbing cattle baron is bad. And when a character is thrown in between these extremes, as when Ronald Reagan's gunslinger shows up, hired to follow the cattle baron's orders, we know right away that he's really a good guy who will step in to save the day when the opportunity presents itself. Passion presents a somewhat more complicated scenario: the twin sister (Yvonne DeCarlo) of Wilde's murdered bride-to-be is presented as an alternative mate for Wilde, and late in the movie he learns that his missing (presumed dead) baby son is alive, having been cared for by peasants -- and thus his all-consuming "passion" for revenge is tempered because he has a future in which his position as a husband and father can be regained. As such, it's not particularly surprising that Cattle Queen of Montana is arguably the weakest of these four Dwan/Bogeaus Westerns and Passion is one of the best. Tennessee's Partner rejects wide open spaces in favor of an ornate gambling parlor chock full of potted plants, chandeliers, bric-a-brac, and beautiful available women who sell cookies for $5 each and bottles of champagne for $25. This definitely isn't the rustic world of Kitty's saloon in Gunsmoke. This world is more elegant and more mercenary. Onto this environment, Dwan turns his camera, under the guidance of the great cinematographer John Alton. The camera glides effortlessly around the powdered ladies, the plush, overstuffed sofas, and the green felt topped poker tables. It's one of the most detailed and evocative portraits of frontier gambling and prostitution ever committed to celluloid. Largely because of the vividness of this milieu, Tennessee's Partner becomes engrossing. John Payne plays the high-rolling gambler named Tennessee who is entrusted with lightening the wallets of the visitors. He isn't your typical Western hero. His code of honor is flexible and largely revolves around the mark/customer with the biggest bankroll. However, his sense of honor undergoes a change when a past flame -- a golddigger appropriately named "Goldie" -- shows up as the intended bride of "Cowpoke" (which is all the name the movie gives him). Cowpoke had saved Tennessee from an angry gambling house customer who attempted to waylay him. Based on a short story by Bret Harte, Tennessee's Partner strikes a gentle, playful mood unlike the more serious Passion or the more intense Silver Lode. The movie is somewhat marred by Ronald Reagan's friendly-but-lightweight presence as cowpoke, but the rest of the cast is first rate, including Coleen Gray as Goldie and Rhonda Fleming as the Duchess, the gambling hall's madame. And John Payne's big city sophistication and snake-oil salesman sneers make him a fascinating counterpoint to Reagan's aw-shucks charm. 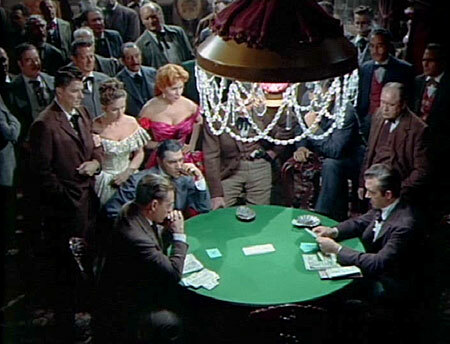 Silver Lode follows much of the same terrain as High Noon (1950), showing us a town whose character begins to split when presented with the option of supporting their friend or accepting the murder charge brought against him. And like High Noon, Silver Lode has been read by many critics as a commentary on the anti-communist hearings that shook up Hollywood in the '40s and '50s (and in case anyone misses the point, Duryea's character is named "McCarty"). However, this reworking of the High Noon scenario -- complete with a saloon girl (Rhonda Fleming) who knew him before he went legit (much like Katy Jurado in High Noon) -- functions as if its screenwriter (Karen De Wolf) had heard the complaints of Western traditionalists, such as director Howard Hawks, who had argued that no self-respecting sheriff would go running around town like a chicken with his head cut off asking for help. In Silver Lode, the hero asks for help -- but not for firepower. Instead, he needs help from the local judge (Can he fight extradition?) and the telegraph office (Is the marshal who he claims to be?). vSilver Lode starts in overdrive and then tries to stay in high gear throughout -- a claustrophobic story structure more in keeping with crime dramas and film noir. Guiding a Western, this structure tends to be overbearing, forcing a series of deaths so that Ballard can be implicated as the killer and thus shake the town's faith in their friend. However, Silver Lode carries possibly the highest reputation of any of the Dwan/Bogeaus Westerns. In a poll of French film critics in 1966, Silver Lode was ranked in the #7 slot as one of the all-time great Westerns, followed closely by Tennessee's Partner at #11. Recognition for these films has come somewhat more begrudgingly in America. For one thing, they lack any of the actors who became inextricably linked to the Western. There's no John Wayne, Henry Fonda, Gary Cooper, Jimmy Stewart, Robert Mitchum, Joel McCrea, or Randolph Scott. And in America's star-centered culture, this lacking has made these movies tougher to market. As further evidence of the marginal status of these films, instead of coming from one of the major video distributors, these DVDs come from a relatively small video company out of Oklahoma named VCI Entertainment. Specializing in cult items and overlooked films, VCI has carved a valuable niche by picking up movies like these that might otherwise fall through the cracks and go unavailable. The video transfers are in decent shape but beware if you plan to watch any of these films on a PC monitor: we had to force our PC DVD player into "bob mode" mode (usually reserved for animation films, not for live-action films) in order to eliminate an annoying textured edge to the images. However, the DVDs looked fine on a regular DVD player. Thanks to the folks at VCI, Westerns fans can now re-examine these unpretentious examples of his work. You'll find few consistent themes or story elements in Dwan's movies. Rather he tackled a diverse (some might say indiscriminate) group of subjects and treated each with a brisk, energetic approach that emphasized action and adventure. If he had chosen projects more carefully, his reputation might be higher today.